Hello and shalom from Ben and Liz Cassutto here at Lightbeacon Ministries. Much has happened to us this summer, most notably my trip to Israel. It was an incredible experience and it would take a large amount of time to go over every detail of the trip. But thanks to my brother George, whom I accompanied on the trip, we can get an idea of what the trip was like. Please follow the links on the page to pictures or videos that George took on the trip. For each image you visit, a new window will open. All images © George Cassutto 2004. 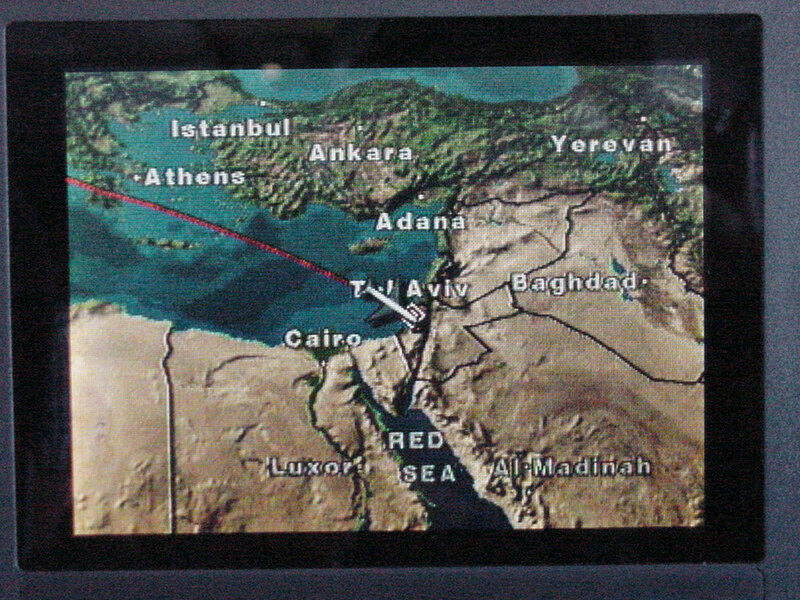 Our trip started with the airline flight to Tel Aviv. Note how close to Baghdad it is! 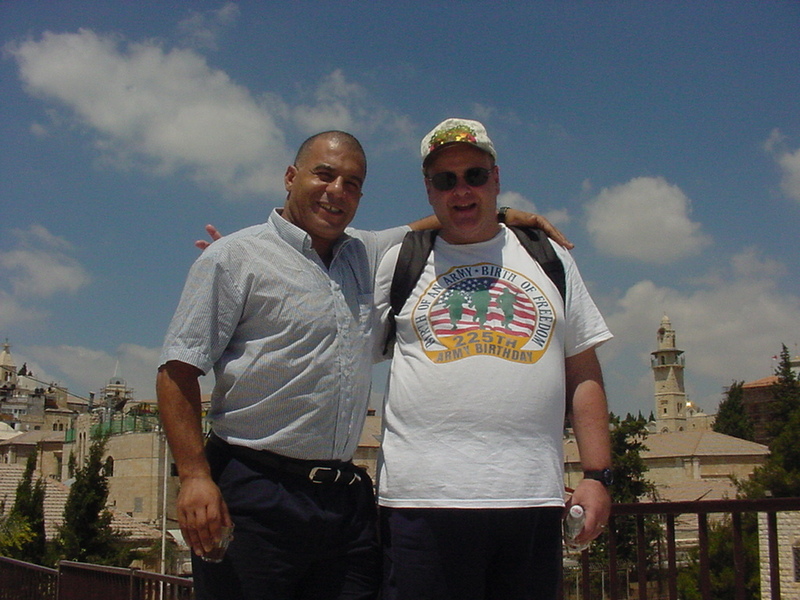 George and I were in the Holy land to attend a conference for Holocaust Educators at Yad Vashem. We started our time there with tour of Yad Vashem where the history of the Holocaust and anti-Semitism were discussed. 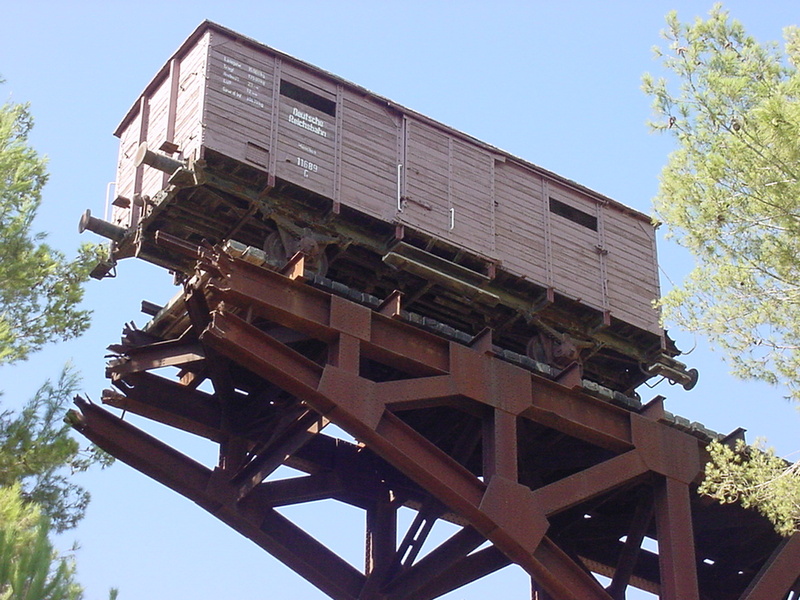 There were many very moving exhibits such as these "Jewish Stars" which were very similar to those my parents had to wear, and this "Cattle Car" from Belgium which was actually used to transport Jews to the gas chambers. Yad Vashem is dedicated to honoring righteous among the nations who helped hide Jews such as my parents, Elly and Ernest Cassutto. 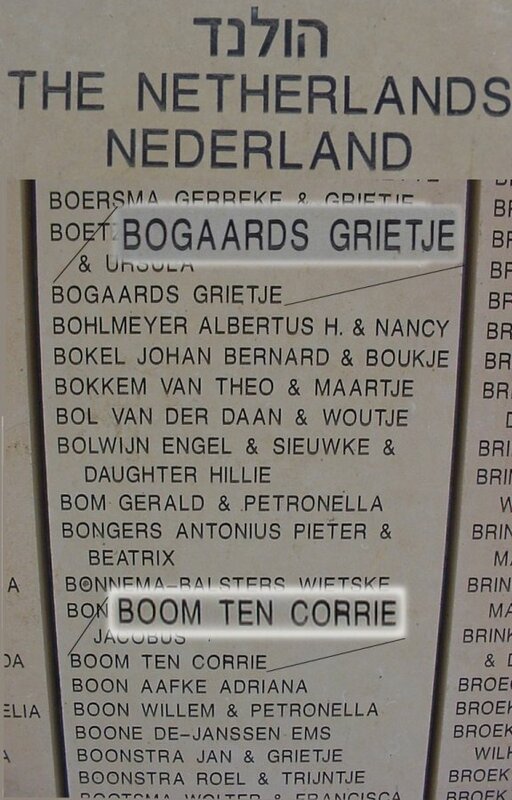 One of these most well known was Corrie Ten Boom whose tree we found at the Museum. For our stay in Israel we lodged at the beautiful Kibbutz and Guest House Ramat Rachel. 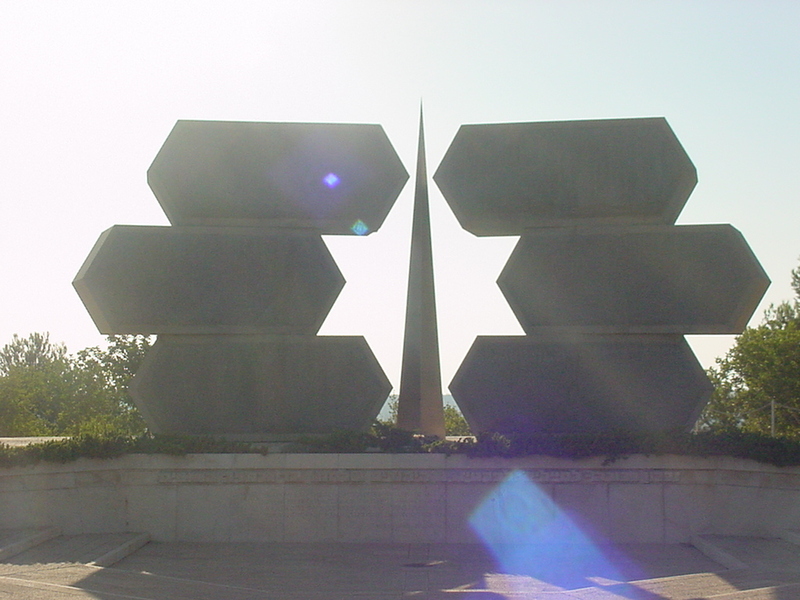 A few kilometers walk from our hotel is a monument to the Six Day War. You can still see mines and army bunkers even to this day. 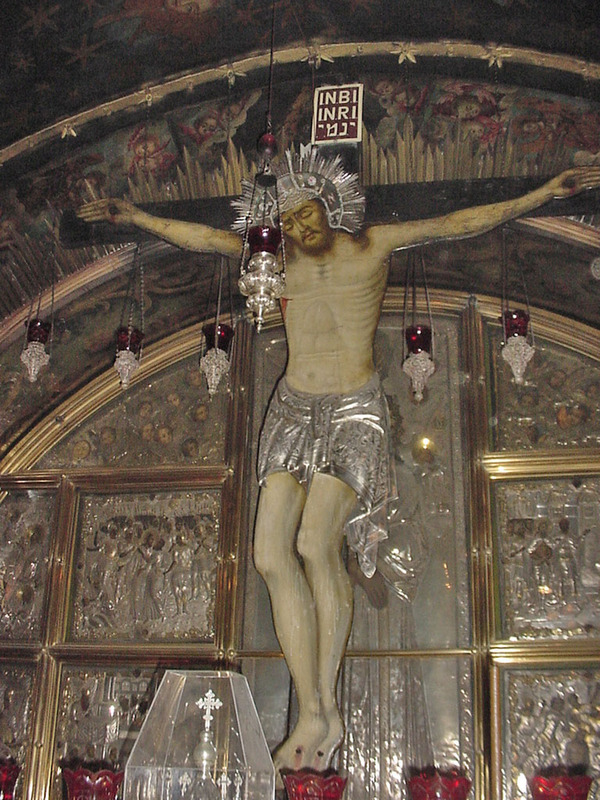 The conference provided wonderful tours of places in Jerusalem in the evenings. 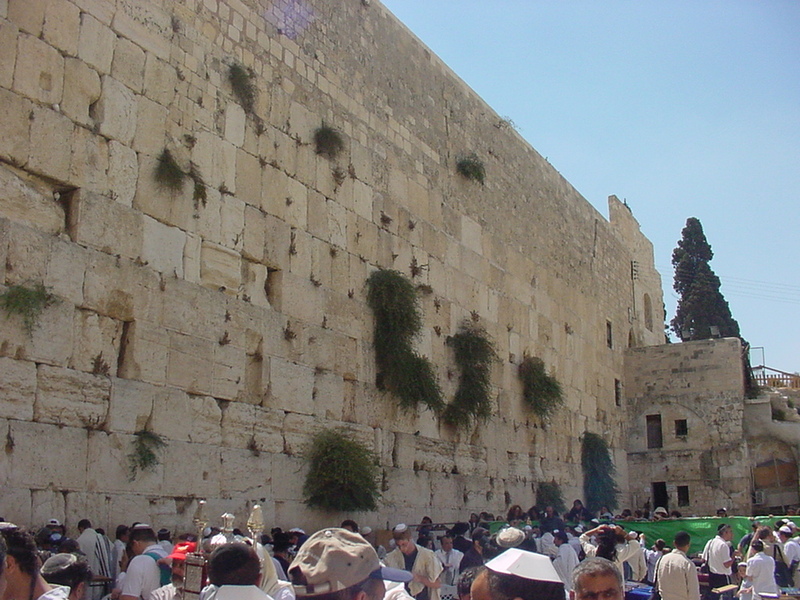 On Monday we had a tour of the Old City which included "The Wailing Wall". 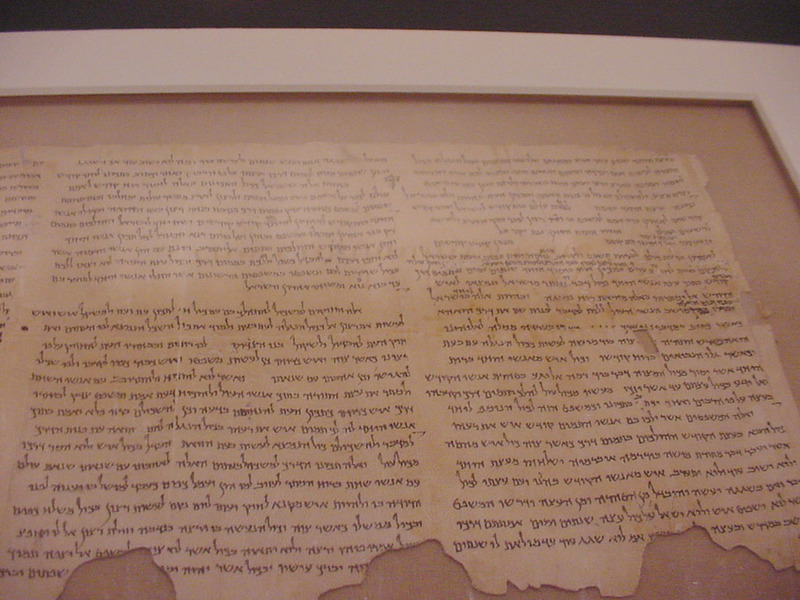 On Tuesday we went to the Israeli Museum where the "Dead Sea Scrolls" are enshrined. 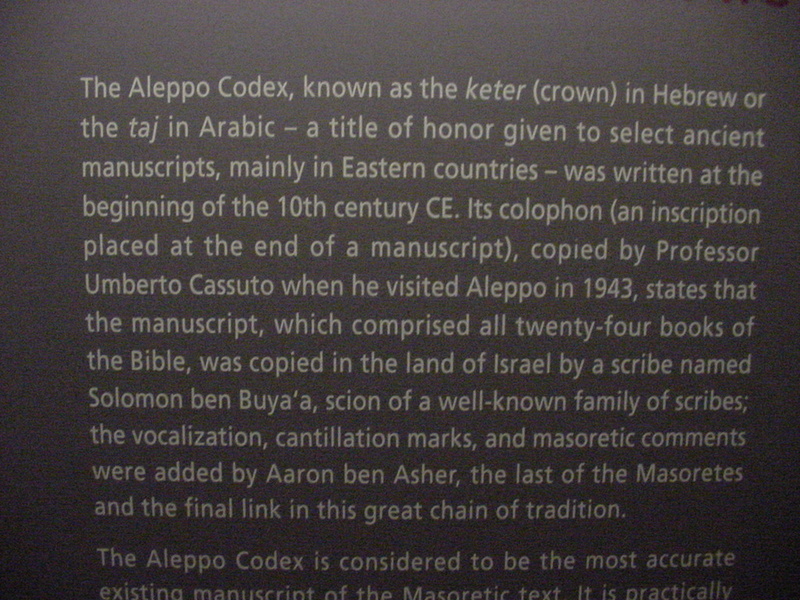 While there we saw the references to Aleppo Codex, a very old manuscript of the Tenach which was copied and verified by renowned Rabbi and Bible scholar, Umberto Cassuto, who is a distant relative of ours. These pictures were "Illegally" taken by George. On the last day of the conference I gave my presentation (this link opens a PowerPoint presentation) concerning "The Dutch Christians in the Netherlands and their effects on Jewish Identity". Although not as well attended as I had hoped my brother said it was the best presentation he had seen. 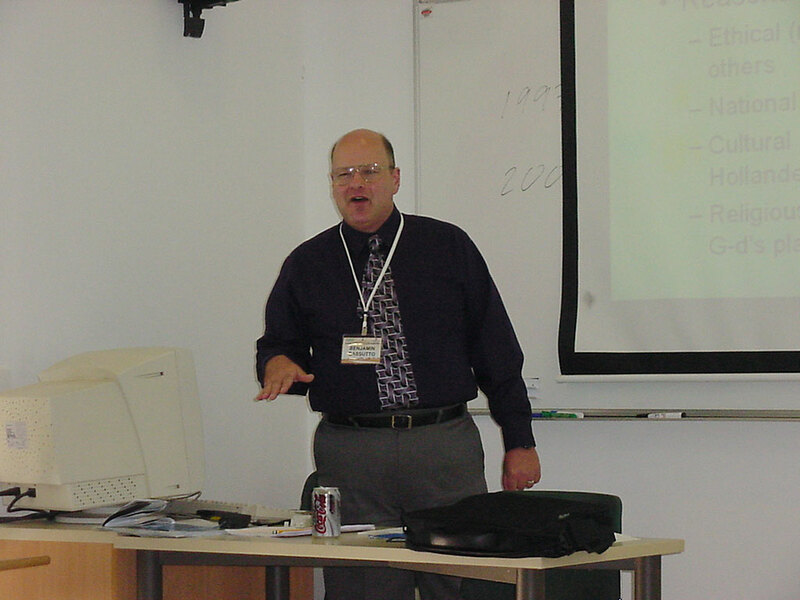 He gave his presentation on teaching the Holocaust using the internet the day before. It was also very well received. 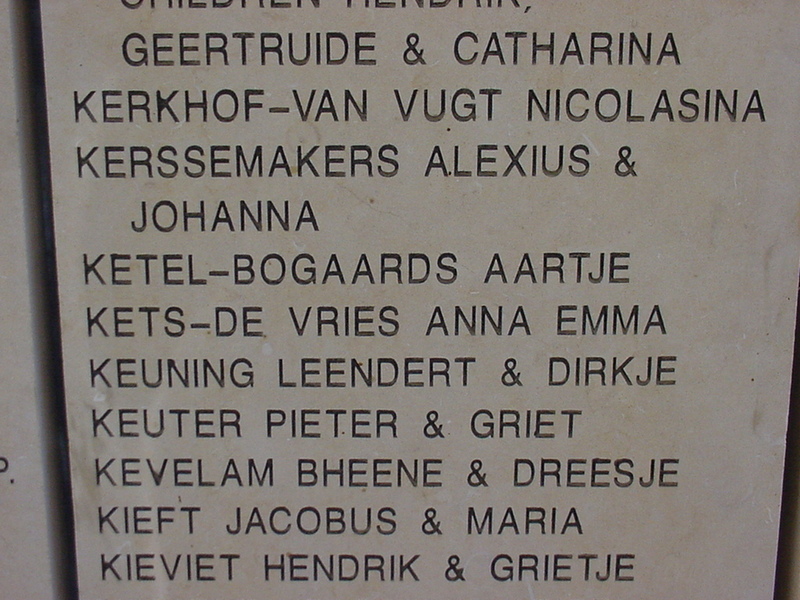 Also very important to our family history was the research that I did to find the names of those who hid my mother and my Uncle Henri during the war. 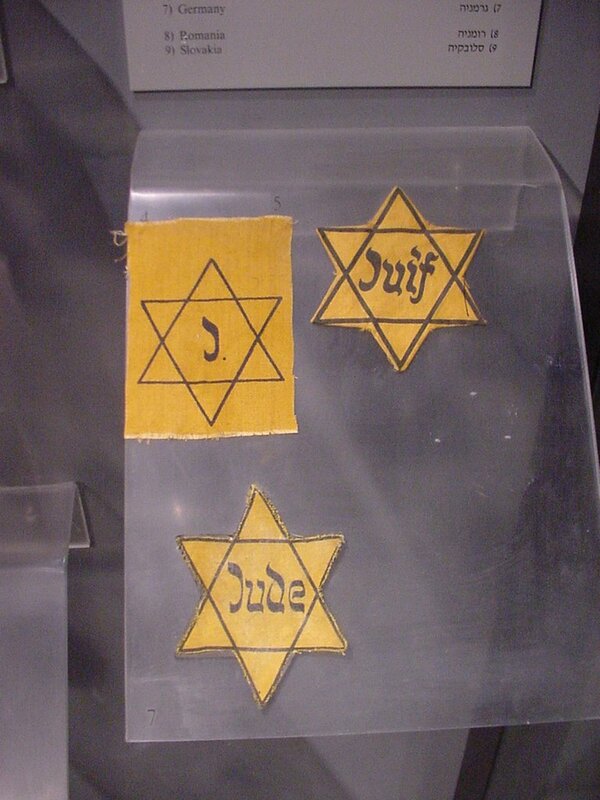 I went to the Yad Vashem administration building which had the file of where the names of these righteous were. 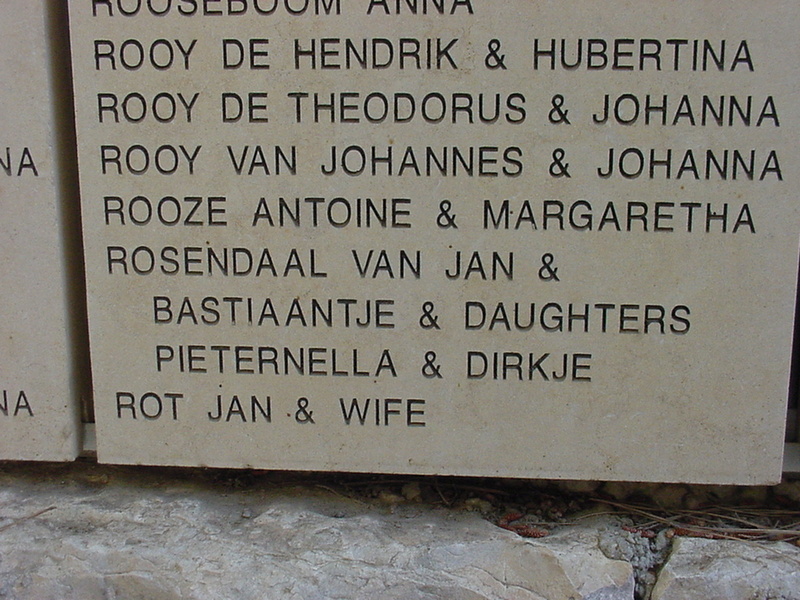 Although they were not given a tree, the names of Gretje Bogaards, (Tante Grie to us), Aartje Bogaards-Ketel, and the Van Roosendaal family are all enshrined in the "Garden of the Righteous". On Thursday we had a "free" day, so we went to the Old City again during the day, since the tour at night did not include any of the Christian sites for obvious reasons. We started out back at the Western Wall so we could get pictures of it during the day. 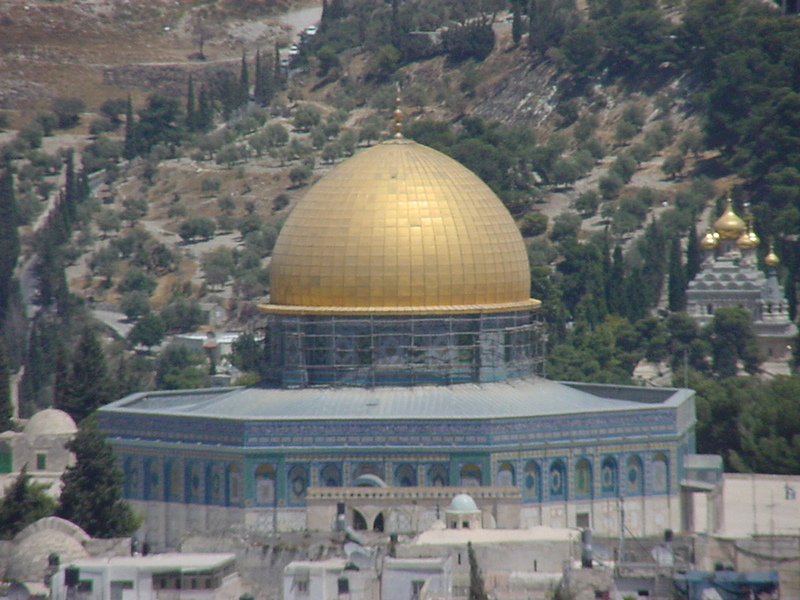 The Dome of the Rock is off limits to tourists of course. 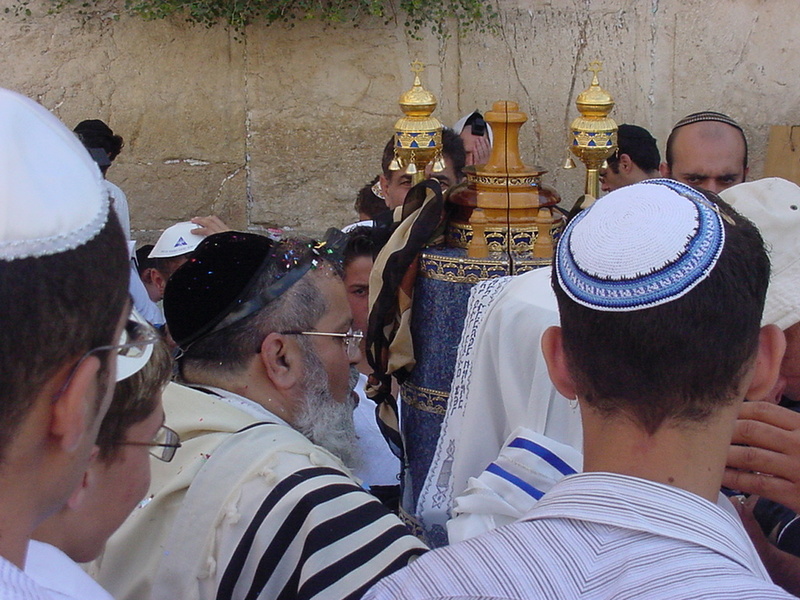 Every Thursday is "Bar Mitzvah" day at the wailing wall, so we saw at least two of them while we were there. Then an orthodox Jewish boy asked me if I was Jewish to of course I responded "Yes" and then he asked me if I wanted to put on teffilin. 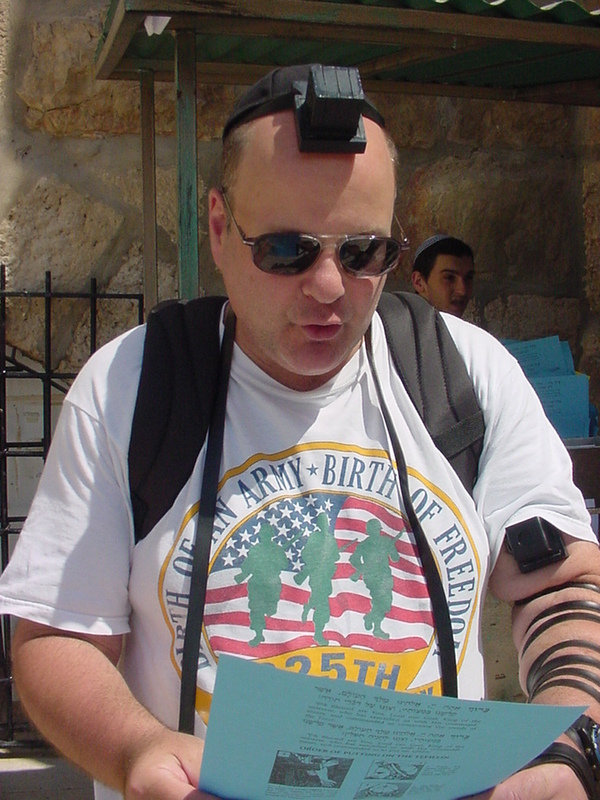 Here I am reciting the Shema and the VaHavta (Deuteronomy 6:4-9) with the phylactery and armbands on. Then we went to the Christian part of the city where Yeshua (Jesus) spent his last week on Earth. On the way we encountered Al, (a Bedouin southern Baptist! 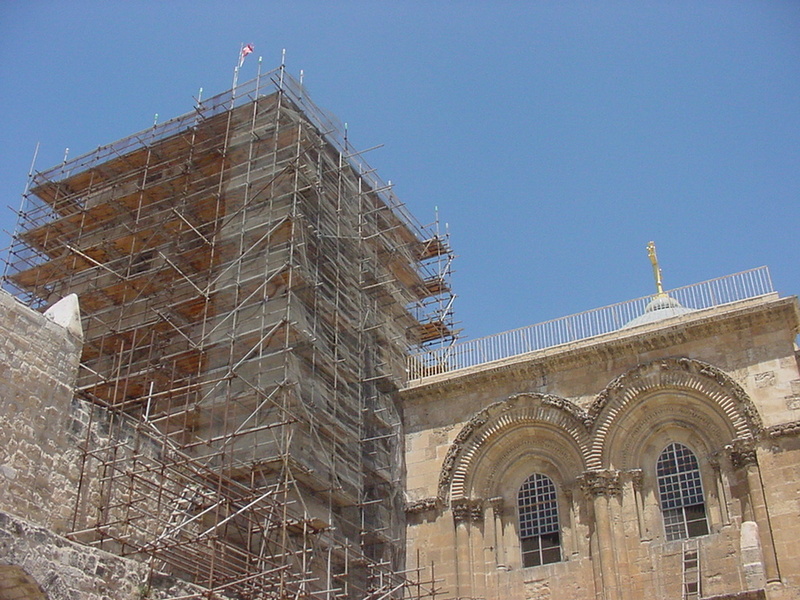 ), who showed us the way to the Church of the Holy Sepulcher, the place where Yeshua was placed on the execution stake. On Friday we took a day tour of the Dead Sea and Masada. 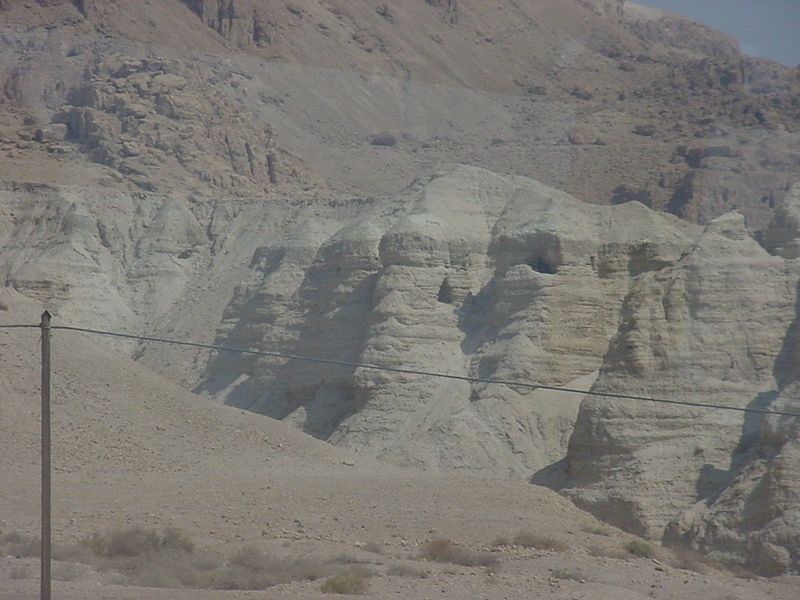 On the bus drive we passed Qumran, and the tour guide showed us the actual caves (the dark indentation in the rock face) where the Dead Sea Scrolls were found. 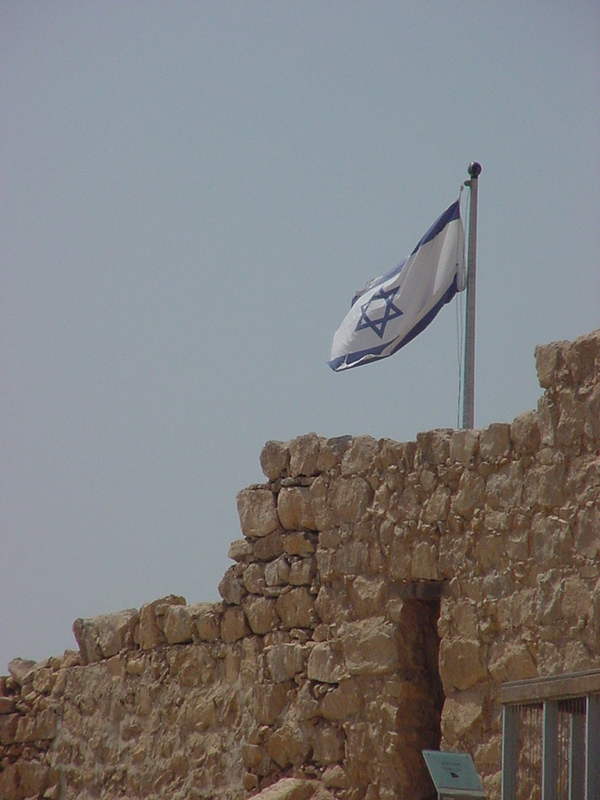 If you are unfamiliar of the story of Masada, it was one of King Herod's fortresses which 900 Jewish rebels stood against the Roman Army for four years (from 70-74 A.D.) after the invasion of Jerusalem. 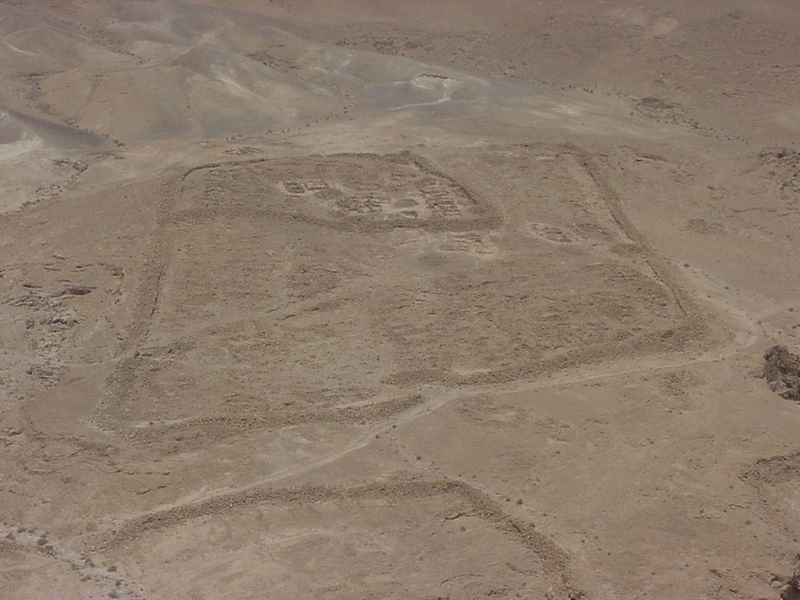 The Roman army formed encampments but they could not invade the fortress. Eventually they built a ramp and barricaded the fortress, but when they arrived they found all 900 rebels had committed suicide rather than become slaves to the Romans. 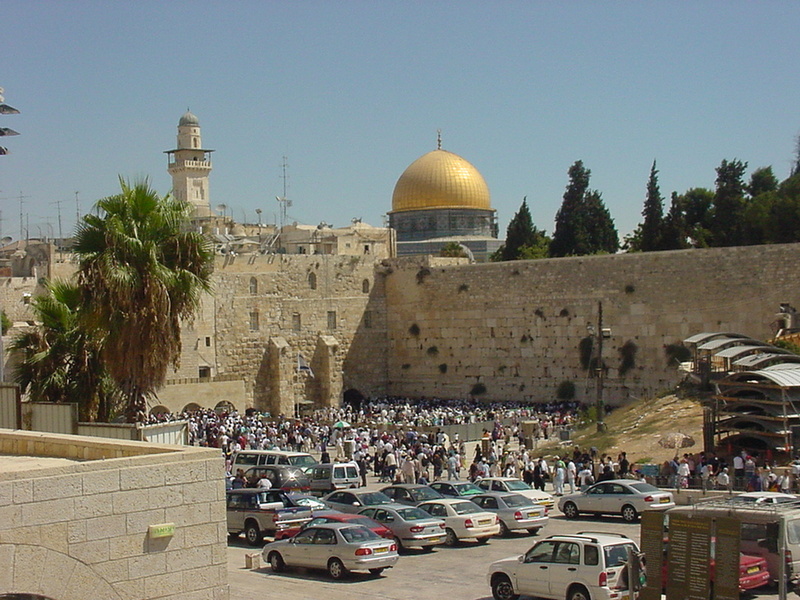 The legend is that the famous Jewish historian Josephus was among the Romans and documented the whole siege. 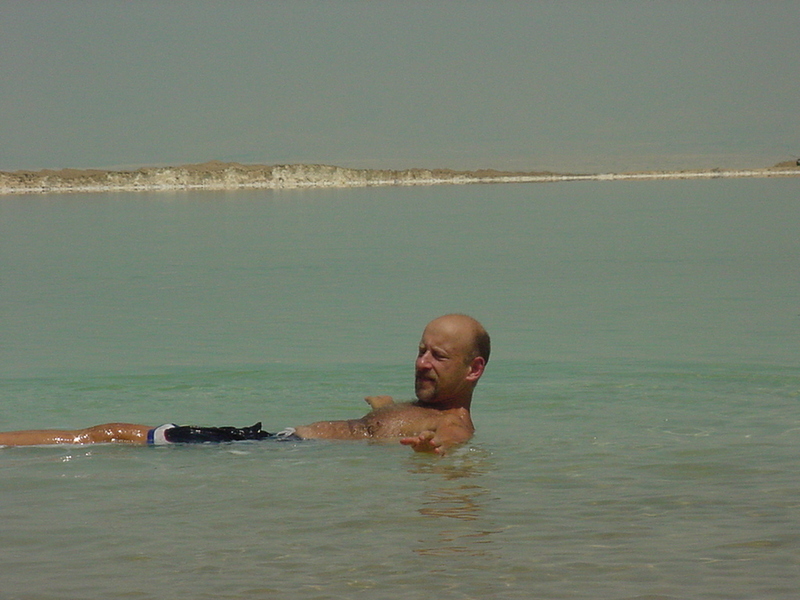 After the very hot experience in Masada, we were taken to a beautiful spa at the Dead Sea where you can actually swim in the sea and float (what George and I both did) because with the amount of salt in the water, you become buoyant. 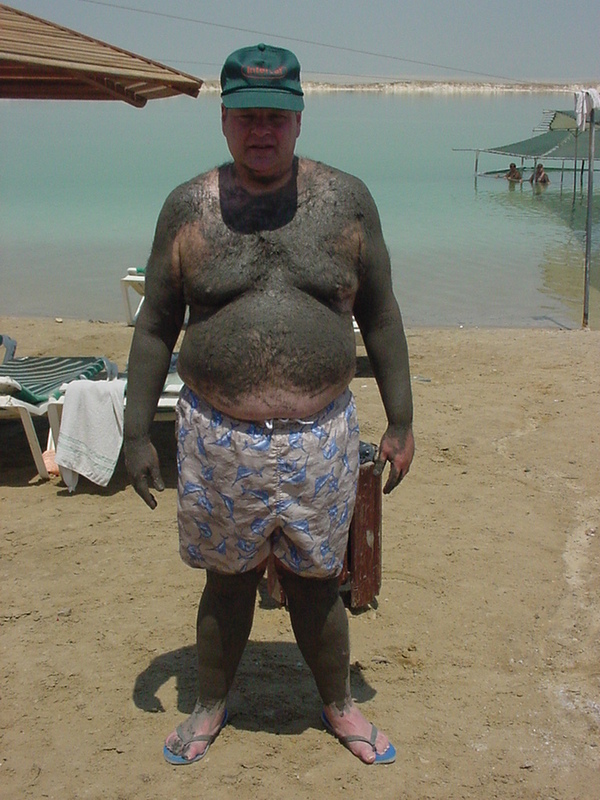 You are also given a packet of Dead Sea mud, to put on your skin, because it has healing properties. 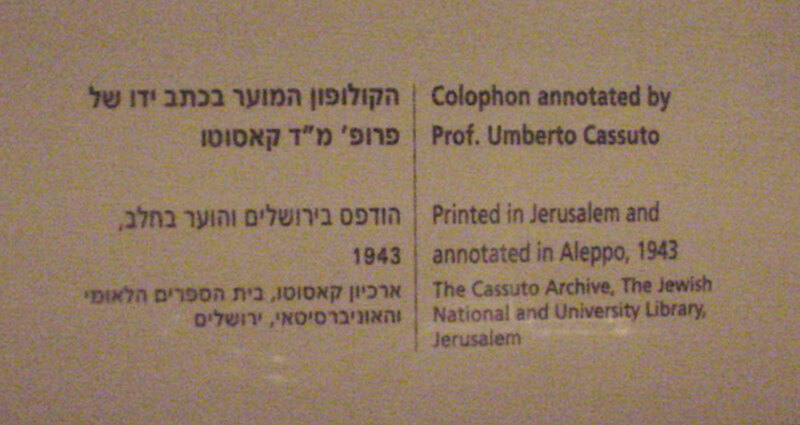 Friday night, we had a wonderful Sabbath dinner with David Cassuto, the grandson of Umberto Cassuto who as explained earlier verified the Aleppo codex and translated its inscription. 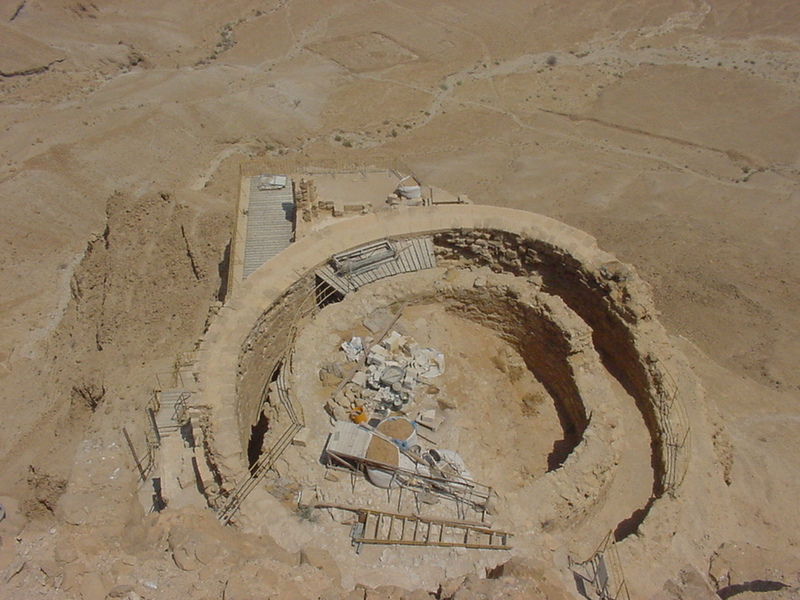 According to David Cassuto, His grandfather also assisted in verifying the authenticity of the Dead Sea scrolls when they were found in 1947. Unfortunately do not have a picture of David Cassuto because He is a very observant Jew and would not allow a photograph on Shabbat, but he was very gracious and certainly remembered our Uncle George Cassuto who would visit him whenever he was in Israel. Well, wow, what an awesome trip. 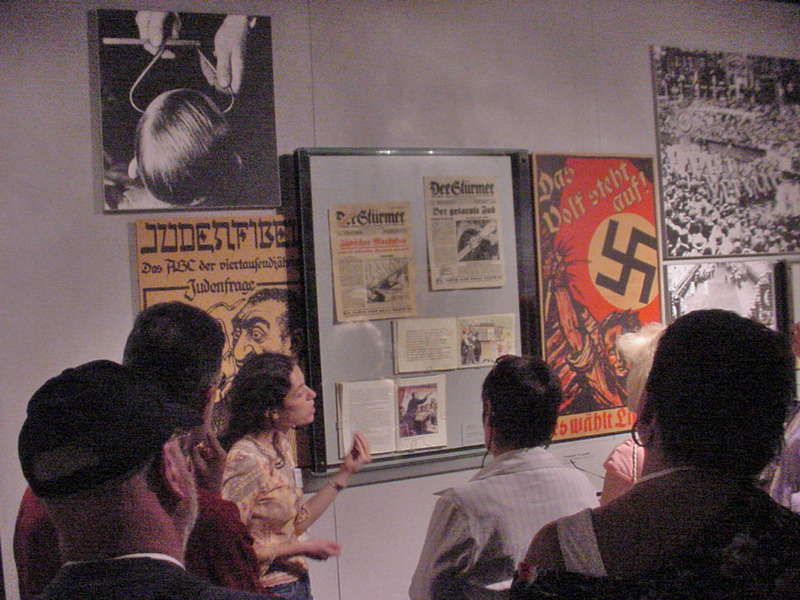 In the next in a series of newsletters concerning my trip to Israel, I will begin to discuss some of the presentations from the conference at Yad Vashem which had to do with the continuing rise of post-holocaust anti-Semitism, anti-Americanism, denial of the Holocaust, and the current difficulties in Arab-Israeli relations. As always, Lightbeacon Ministry and Services is dedicated to bringing Good News of Yeshua (Jesus) to the Jewish people and sharing with the church how to relate to and understand the importance of their Jewish roots and Judeo-Christian culture through- articles and Jewish Holy day presentations, books such as "Buried Treasure" by Elizabeth Mickel-Cassutto, and "The Last Jew Of Rotterdam" by Ben Cassutto. If you would like to order any books, are in need of Messianic materials, or would like to schedule a speaking engagement, please go to our website at http://www.lightbeaconministries.com/about.html, write us at P.O. Box 1445, Millsboro, DE, or e-mail us at shalomfriend@hotmail.com. Shalom and have a Jewish Holiday season.